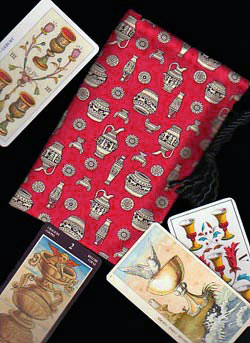 Alabaster jars, ornate chalices, and classical pitchers rest on a scarlet red background. 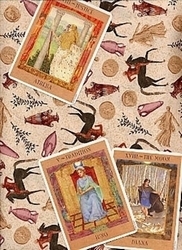 They recreate the water-bearing vessels drawn on tarot cards by numerous artists over the last four centuries. 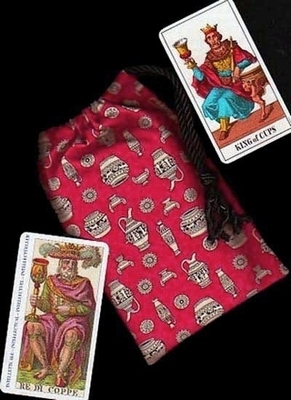 We've all seen such vessels held by kings and queens on court card illustrations, held by beautiful women on the Temperance and Star cards, and on the ten cards best known as the Cups or Chalices suit of the minor arcana. 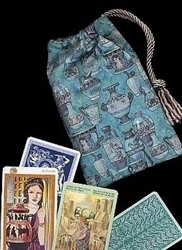 The bag is pictured with chalice/cup cards from the 1JJ Tarot, the Classic Tarot, Tarot of D�rer, and the Illuminating Ancient Tarots (aka Sola Busca). 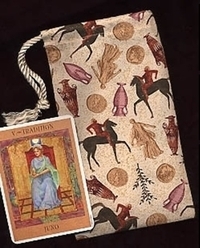 Click the image below to see another view of the Chalices tarot bag. 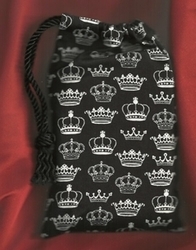 Chalice Symbolism: Cups, like all vessels that hold liquid, are associated with intuition and emotions. Chalices and cups are also associated with the womb, the moon, the miracle of childbirth, and with women's mysteries in general.